Feed your passion for chain maille in a collection of new, extraordinary chain maille weaves and challenging projects that will both inspire and educate in advanced chain maille jewellery workshop. Setting the stage with two basic weaves, author Karen Karon then offers detailed. step by step instruction for the more complex weaves in this book. Each weave is highly illustrated and Karen offers valuable tips throughout to help ensure a beautiful finished piece. Chain maille earrings, rings, bracelets and necklaces feature unusual techniques such as less common Persian weaves, elf based weaves, hybrid weaves and scale weaves that incorporate sheet metal scales into traditional weaves for a striking effect. Each weave chapter contains two jewellery projects that will further develop your ability to apply design to technique. 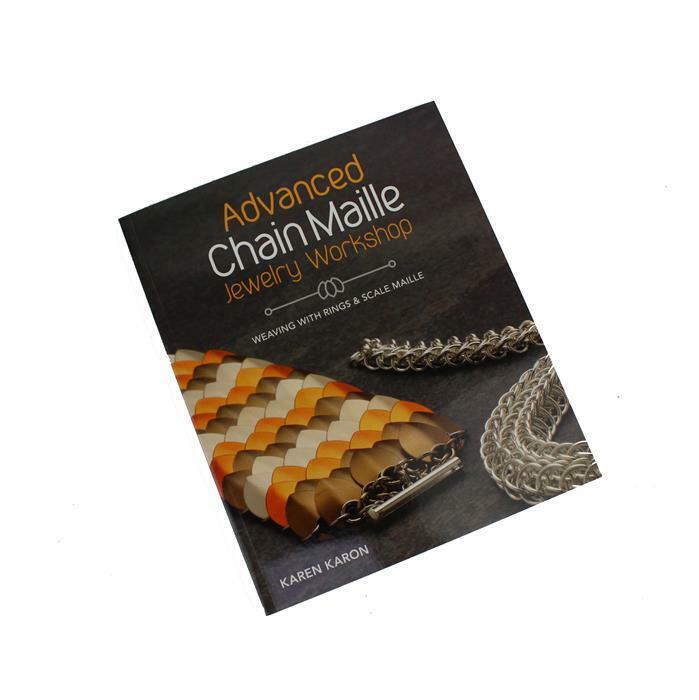 With Advanced chain maille jewellery workshop, go well beyond the basics and elevate your jewellery to the next level. An excellent guide to advanced designs - really pleased with this purchase. Not happy with the transport system though - this is the second book that has arrived damaged via Whistl's transportation methods. Not impressed with their "unfit for purpose" methods.